BEFORE: Happy beginning of October! I’m still working on a few chains for this month. The baseball chain is set but I still have to obtain a few of the films from the public library so it could be altered. And of course there will be a major horror chain coming later in the month closer to Halloween. Right now, I’ve got a tentative schedule for a week of horror, but I’m still shuffling things around and seeing about expanding the list a bit. So stay tuned, there’s big things happening. Today’s film, Five Minutes of Heaven was originally scheduled after Trainspotting so I could make a Ewan McGregor and Liam Neeson connection (Star Wars: Episode I) but it was delayed due to some last-minute additions. Now it’s just the next film in the marathon. AFTER: Organization is a critical part of filmmaking. The order and duration has a big impact on the the film and when done poorly, has a very negative impact. Five Minutes of Heaven is an example of poor organization. Many scenes ran way too long and focused on trivial pieces of information. Very quickly it becomes easy to lose attention and get distracted from what is happening on the screen. There needs to be a clear direction where the story is going; if not, the story seems to drag on and on. The order was also a bit confusing; not temporally but spatially. 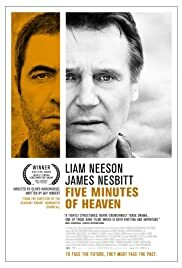 Five Minutes of Heaven opens with a montage of the violence in 1970s Ireland accompanied by a voice over of Alistair Little (Liam Neeson). Later on in the film, the same monologue is repeated by Little for the video program being recorded. Again, it was easy to make the connection that it was the same speech, the question is, why? Why did the monologue need to be repeated? Liam Neeson and James Nesbitt both gave decent performances. The production value was also fairly good, as is to be expected from the BBC, but all of this was lost because the organization of the film was so poorly structured. It’d be hard to recommend watching Five Minutes of Heaven but on the bright side, I’m now even more excited to see The Hobbit because of Nesbitt’s involvement.